For months now, I’ve had it in my head to do a series here on the blog that would give new canners everything they needed to know to get started. A collection of posts that would detail necessary equipment, the boiling water bath process, best safety practices, good starter recipes, tips for successful jam making, and hints on how to make flavorful, texturally pleasing pickles. As is the case with so many ideas, it’s taken me a while to bring it from concept to execution, but my plan is to start this series now and continue for the next six to eight weeks. As we move along, if you feel like there’s something that belongs in a canning primer that I’m missing, do get in touch and let me know. One of the misconceptions about canning is the belief that you must have a dedicated canning pot in order to can. This is not true. All you need is a pot that is tall enough to hold a rack, your jars, an inch of water above the jars and an additional inch or so of space where the water can boil. Most often, I use this 12 quart stock pot made buy Cuisinart (in the picture above, it’s the one on the left). For batches that only make three or four jars, I use the yellow stock pot in the middle of the photo (made by Dansk, that one was an eBay find). And for when I only have two or three half pints to process, I use a 4th burner pot . Any time you turn a stock pot into a canning pot, you need to find a small rack to drop into the bottom. I’ve used round cake cooling racks, kitchen towels, a layer of old canning jar rings, dedicated racks like this one from Progressive International (it’s quite good). However, my favorite is this silicone trivet . It folds up for easy storage, never rusts, and because it’s flexible, it works in a fairly wide array of pots. Obviously, you don’t need to have all three of these pots when you’re starting out. The idea is simply to show that nearly any tall pot can serve as a canner and that if you’re only canning a few jars, you can use a smaller pot, should you have one in your kitchen arsenal. Once you have your canning pot figured out, you need a pot in which to cook your product. For jams, jellies, tomato products, chutneys, and other products that need to be cooked down, I typically opt for a roomy Dutch oven. I really like the my nine quart Le Creuset that’s pictured above for its ability to conduct heat. I also regularly use an 8 quart stainless steel All-Clad Dutch oven , particularly when I’m cooking something that I know has a tendency to burn (my tomato jam springs to mind). You can always scrub a burnt spot off stainless steel. It’s harder to do without ruining the finish on an enameled pan. 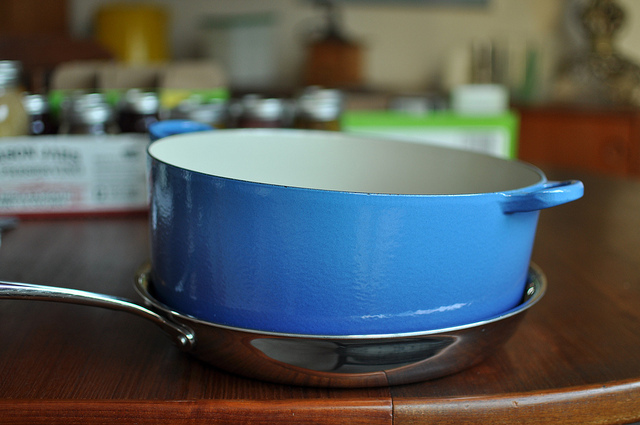 I also recently added a Sur La Table 8 quart pan to the set of cookware I take to canning classes and I like it. It’s not quite as low and wide as the All-Clad model (a plus when trying to encourage evaporation), but is of equal tri-ply quality for about $100 less. I also use a stainless steel skillet for a lot of my very small batches. The one I have is from that crazily high rated set of tri-ply cookware made by Tramontina that only Walmart* appears to sell. It’s also a third of the price of a comparable All-Clad model . Sur La Table makes a nice one that falls in the middle of the price range. Because these small batches quickly over very high heat, you want something that will perform well under those conditions and I’ve found that any heavy, low, wide stainless skillet will do. 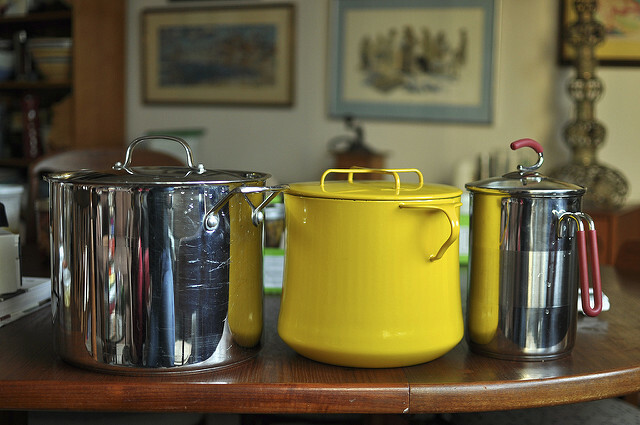 For heating pickle brines, I always turn to the 4th burner pot pictured above. Because it’s got both the spout and the handle, it makes it a breeze to pour the brine into the jars. Finally, we come to the small tools. You’ll need a knife and a cutting board, but I figure most of you have those, so they’re not pictured here. 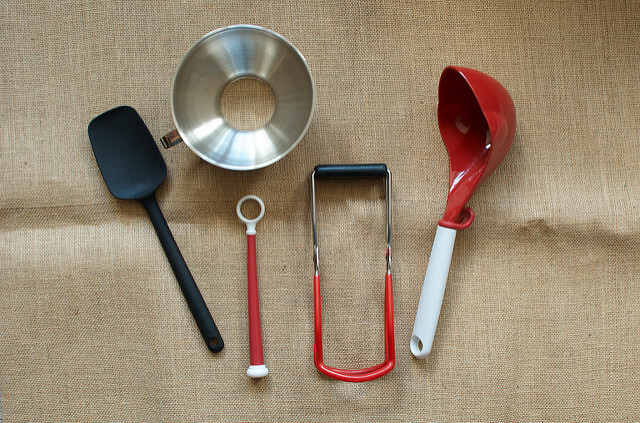 A heatproof tool for stirring and scraping is always good and that silicone one on the left end is my favorite because it can go in the dishwasher (have five of them, to ensure that at least one is always clean). A wide mouth funnel is always useful for getting your products into jars without a huge mess. I like the stainless steel ones just a little bit better than the plastic, but use both regularly. A jar lifter is a handy tool to have and I’ve found that the one made by Progressive International is my favorite (it’s got a stronger magnet than most, which makes retrieving lids a bit easier). Jar lifters are designed to give you a secure grip on the jars as you move them in and out of the water. Though the jar lifter has been redesigned repeatedly over the last few years, I find that I still like the classic model the best (even if the rubber on the grips does have a tendency to peel away over time). Finally, you want a good tool to move your product from the pot and into the jars. For years, I used an 8-ounce measuring cup to do this job (since it’s the same size as a half pint, you knew that with each scoop, you were getting enough to fill a jar). However, since getting this canning ladle from Progressive International last year, I find that I turn to it for almost every batch. Like my measuring cup, it’s sized to hold one cup, really does a good job of getting those tricky last drops out of the bottom of the pot, and has a little hook that allows you rest it on the pot between scoops so that it doesn’t slide away and make a mess. If they made it in stainless steel, it would be the most perfect ladle ever. Other tools that I like. Potato mashers! They help break down large chunks without pureeing like an immersion blender does. I like this one and this one . Skinny silicone spatulas! They are the perfect tool for easing air bubbles out of pickles and whole canned fruit because they can slip in without doing a lot of damage. Paper towels or reusable cloth towels, like these from Athena Creates. I use these for wiping jar rims, cleaning up spills, and generally controlling the mess of canning. As you’ve read through this post, you’ve probably noticed that a number of the things I call for are items that already exist in your kitchen. And if you don’t have exactly what I’m recommending, chances are you have something similar. Truly, it’s a kitchen task that many are already equipped to do. Finally, remember that this post details just my opinions. You may have or discover favorites that aren’t mentioned here anywhere. Such is the way of life. *I know Walmart isn’t for everyone (and they aren’t typically for me), but this particular line of cookware is of amazingly high quality and is ridiculously affordable. Disclosure: This post is liberally peppered with affiliate links. If you follow those links and subsequently make a purchase, I get a few cents. Additionally, the Progressive International tools I mentioned above were received last year for review and giveaway. The opinions expressed here are the result of a year+ of regular use. No one asked me to update my thoughts or include them in this post, I wrote about them because they’ve proven to be useful. Great post! I’m not brand new to canning, but I’ve been canning on a shoestring kitchen for a few years now. I added several of these tools to my amazon wishlist so that canning will be easier in the future. Thanks!! I love my Kilner Jam pot and Victoria Steamer/Water Bath. I started preserving last year and just love these new additions to my canning set up. Thanks for such a great post! It’s just what I needed. I’ve been sticking to simple refrigerator jams and pickles because I didn’t have the equipment for a water bath and didn’t know where to start. After being frustrated one too many times by the riduculously weak magnet on my lid-lifter, it finally occurred to me that I had a telescoping magnet “wand” in my toolbox just collecting dust (they are used for things like fishing out dropped screws from heating vents and such. Ask me how I know this!). It is perfect for canning because the magnet is super strong and the wand is adjustable to exactly the length you need it to be to fish around in your pot (so no hot steamy fingers). Just be sure to wipe it dry after use so it doesn’t rust. 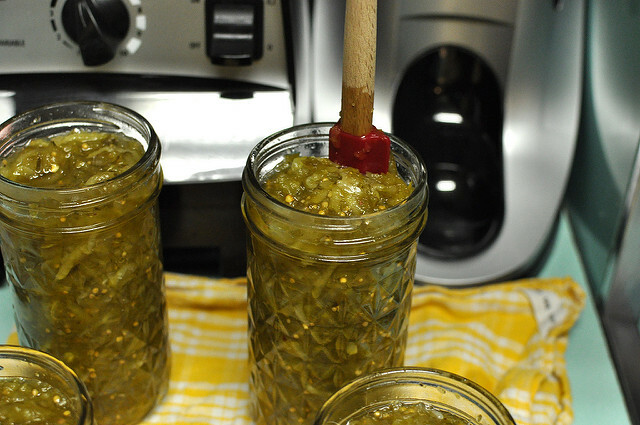 I’m not new to canning and I still got some great tips from this article! Thanks for sharing. The silicone trivet idea is amazing! The brand is Tramontina and the line I like is the clad tri-ply stainless steel. Thanks for this really useful information! I’ll have to track down one of those silicone trivets – they look fantastic. When you process two half-pint jars in your fourth-burner pot, do you stack them? Hi. If you stack them do you need to put some something in between to divide them so they don’t touch? Thanks! I typically use a rigid round cake cooling rack to divide the layers. It’s not technically necessary, but it makes for a more stable arrangement. I just ordered a silicone trivet! I have a blue speckled canning pot with a great rack, but it’s really too big for my electric burners and doesn’t sit right on on them. I’m going to try the silicone trivet in a large stock pot instead. Thanks for the equipment review! I’m going to see if I can make it to your class here in Portland. It’s right up the street from me! Thanks for posting this! I am still new to canning and this straightforward tutorial is really helpful. I look forward to reading more. I have a question about the thermometer you use for making jams. I made a batch a few weeks ago and my therm that clips to the side of the pot didn’t work so well (plus it scratched the bottom of my pan!). So, I got a new digital thermometer that looks similar to one in a picture you put in a jam-making post, but I’m not sure it will work. My concern is if the metal thermometer/temperature gauge sits on the bottom of the pan then it will register a temperature hotter than the actual jam. Is that OK or do you have a better suggestion or a specific kind of thermometer that you love to use? Thanks! I think I read somewhere that your canning pot should have a flat bottom unless you use a gas burner. I used to can in a non-flat-bottom pot when I had a gas stove. Alison, it is true. For one thing, cookware needs to be in contact with the element on an electric or induction range in order to heat effectively. 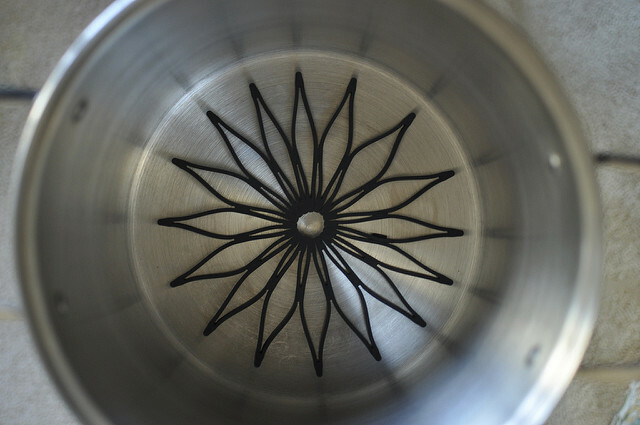 Additionally, a pot with a concave bottom runs the risk of forming a seal with a flat top stove if water is involved. If that happens, it can crack the surface. Love the tip about using a silicone trivet! I have a huge canning pot that I bought a few years ago when I started and honestly it’s way too big for the small canning batches I make. I’m going to try the trivet inside a regular stock pot soon! Also, I’m not sure if your email subscriptions are working correctly. I’ve subscribed and checked my spam folder and new posts are not coming in. I’ve even tried re-subscribing and it tells me that my email is already subscribed. Kara, there are two things you can subscribe to by email. There’s a newsletter which comes fairly infrequently, and there’s the email subscription to blog posts. My best guess is that you’ve signed up to the newsletter and not to the daily email subscription. Hi! I’m new to canning this year and have successfully canned some rhubarb jam and mulberries so far. We have a lot of orange tomatoes and I’m wondering if I can hot water bath can a sauce made with them? Thanks! All tomatoes, no matter the color, are canned the same way. Just make sure to follow a sauce recipe designed for boiling water bath canning and you’ll be fine. You know, I just finally got around to buying that blossom trivet! Such a joy to use when I had only 6 1/2 pint jars to can! I have been wanting to make tea flavored jams! Thanks for the post. I look forward to your series. Thank you so much for this post. I am new to canning and so this information is a great help. I am wondering if you could include some information regarding liquid pectin versus powdered pectin and if they two can be interchanged. Thanks! Thanks you for the VERY informative piece! I can’t wait to make my first canned blackberry jam…hopefully the start of many canned items. I am going to do my boiling in the enamel canner pot over the extra burner on the outdoor grill and keep the heat outside. I have a glass topped stove so it won’t fit and could break the top. I am still imagining the logistics of doing this…ha! I do have to add: why the disclaimer about shopping at Walmart…why do you feel guilty about saving money at a great store?? Wondering if you can answer a question. I made several batches of jam and processed in a bwb, but somehow forgot I needed an inch+ of water over the jars. Apparently I got a little cocky, thought I remembered how to can, and didn’t look at my instructions. Argh. Anyway, I know the jars were completely covered w/ water, just cannot guarantee it was an inch or more. Do I need to toss the jam? Thanks! As long as they were covered, they are fine. The recommendations call for an inch of water to ensure that the water level doesn’t drop and leave the jars uncovered during processing. But for short times, all you need to ensure is that the were submerged. Thank you so much! It’s helpful to know the reasoning behind the depth of water above the jars. Is there any reason I couldn’t use the strainer insert that came with my large stockpot instead of a trivet? It’s deep enough to submerge the jars and then some, and would make for easy jar removal …? Thoughts? No reason at all. Go for it! Thank you so much for the great tips. I have a container garden and I always seem to get more vegetables than I can eat. Hate always having to give things away. Now I can them and not have to worry. I have large stockpots that will work, Now just need to get a jar lifter!! I do have a question, if you please: I really like the idea of the 4th burner pot and am considering getting one. I’ve also lately been obsessed with the Weck 7.4 fl oz jelly jars. How many of them could I safely process in the 4th burner pot at a time? Thanks for any help and the great site! Holly, it doesn’t look like the 7.4 ounce jars would stack well in the 4th burner pot. It’s really only good for wide mouth half pints and Collection Elite half pints. The jars need to be low and wide to fit into it well. what is that star thing at the bottom of your pan? That is the silicone trivet mentioned in this post. It’s what I use as a canning rack. I live in a very, very small house and have little room to store all the nice equipment my grandmothers have. I used the suggestion of just using the largest pot you have to start out and it WORKS. Mind I can only fit one jelly size jar in the thing, but it did safely seal and everything. Now I’m excited and know I enjoy the hobby and can buy something larger. Thank you so much for this post. I purchased the silicone trivet you use, but it always floats up to the top of the pot before I can get the jars in. Do you have any tricks to share? Thank you!! I didn’t know that you all you need is a pot tall enough to hold a rack, jars, and an inch of water above for canning, rather than a dedicated canning pot. My mom is looking to start a big canning project, and it is going to require quite a bit of work with how much she is hoping to produce. Perhaps we should look into an angelus seamer with how much canning there is to do.